The Mike Todd Party: Cronkite Recalls a TV Low Former CBS anchor Walter Cronkite has been at the center of some of broadcasting’s most sublime and memorable moments. But 46 years ago, Cronkite was conscripted into a program that remains one of television’s most memorably vulgar shows: the 1957 Mike Todd party at Madison Square Garden. The veteran journalist comments on news events he reported on that still resonate today. Over a long career, former CBS anchor Walter Cronkite has been at the center of some of broadcasting’s most sublime and memorable moments. But 46 years ago, Cronkite was conscripted into a program that -- even by today’s standards of decadence -- has stood for more than four decades as one of television’s most memorably vulgar events: the 1957 Mike Todd party at Madison Square Garden. 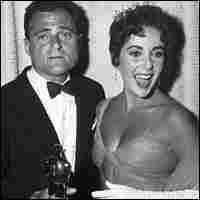 On the first anniversary of the release of his film Around the World in 80 Days, producer Mike Todd and his wife Elizabeth Taylor invited 18,000 of their "close friends" to a Madison Square Garden extravaganza. Boasting a long list of celebrities, an enormous cake and music from Boston Pops conductor Arthur Fiedler, Todd conned the CBS program Playhouse 90 into covering the spectacle live. But when the crowd got out of control, a bland publicity stunt turned into a giant food fight. Cronkite recalls the disastrous night.